Working in the garden the other day, I came across a patch of watercress coming up in the cracks of the walkway. I also found several wayward violets in bloom. Some people I know would have declared these "weeds". But my thought was, "oooh, salad!" There was enough for all five of us. 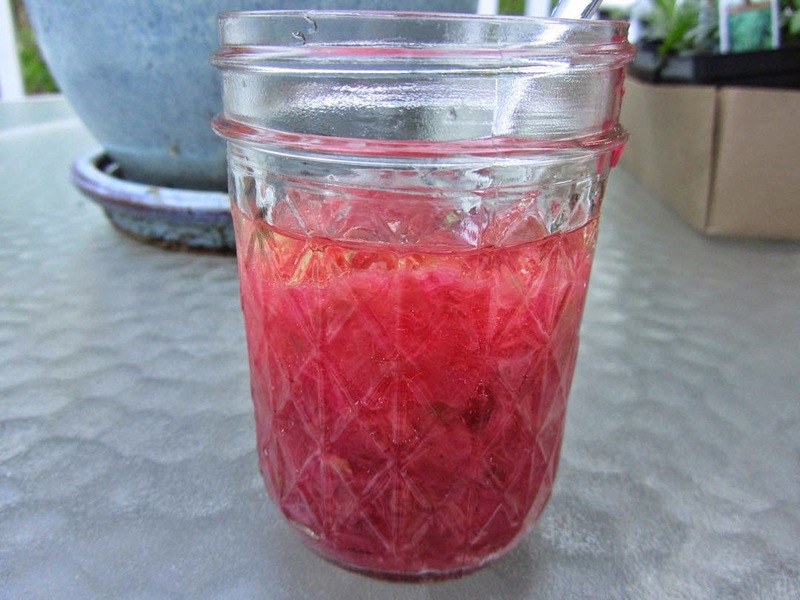 I drizzled individual plates with this rhubarb salad dressing. Do you forage? In our area, fiddlehead ferns are somewhat popular for scavenging. And I know of one lady who eats the dandelion greens from her yard. It wasn't all that long ago in history, that people foraged for food on a regular basis. While we need to be careful not to ingest anything poisonous, I do think it's silly to think that all of our food has to come from a store. I don't forage but I often think about it. My son used to forage occasionally when he was younger. I don't know how your salad tasted, but it was certainly beautiful with violets and rhubarb dressing. It was delicious! I was a bit afraid that the watercress would be overpowering, as some of it was older growth for the season, but the rhubarb dressing tempered it. I'll be checking for more watercress and violets later this week. What did your son find to forage? Along time ago, when our first two sons were very small, my husband would take them outside to gather a "wild salad". We lived at the time in a 300 + acre county park. They loved the experience and ate the salad as well. (Of course the stern instruction was to ask one of us if something was edible.) And now they do it with their children. That sounds like beautiful place where you lived. And how wonderful of your husband to introduce your sons to the art of foraging a salad! I didn't know violets were edible. But did you know red bud blossoms are? They are delicious and reminiscent of cabbage. And they look quite pretty in a salad. Several days ago my grandson was here helping in our garden and we enjoyed red bud blossoms together. He couldn't get over that you could eat them! I didn't know that about red bud. Your grandson must have thought this was so exciting. Usually the adults tell us *not* to eat things in the wild. What a fun time the two of you must have had. What a beautiful salad! What do violets taste like? Is there anything you can compare the taste to? I haven't foraged yet, but I want to try. My great aunt often made dandelion tea, but that was for some herbal/medicinal purpose. I can't recall what ailment she was hoping to treat. A few years ago, I read in a blog about making dandelion jelly. It looked so pretty in the jars and is supposedly tasty. I want to try that! I haven't done it yet, but maybe this year will be the year. Sweet violets (also known as English violets) are a bit perfumey and sweet. They're often used in teas, jelly and candied/crystallized for edible decor. 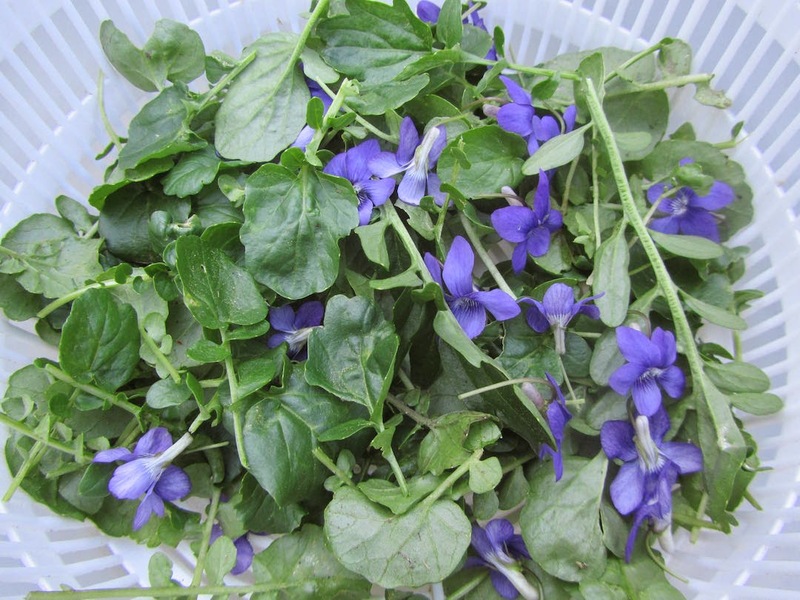 My violets are viola Labradorica, which are much, much milder in flavor, but the leaves are still used in tea, and the blossoms as edible decor. I use them as decor mostly, to top cakes and add to salads. Dandelion jelly sounds intriguing! Let me know how that goes. ooh, I'd love to make dandelion jelly. Where did you find the recipe? Oh, nasturtiums are so beautiful in a salad. I have a neighbor who plants a large pot by her front door (in full sun, so does very well) of nasturtiums, just for adding to salads. The pot looks beautiful, as if it were an ornamental, but then has these lovely blooms to add to the plate. I've never heard of Indian Cucumber. It sounds very interesting! My husband loves to forage. Wild grapes grow on the property where he works, and he has made grape jelly from them. My parents have lots of wild fruit that grows on their property and I felt like Laura Ingalls as a girl when I would pick wild strawberries and black raspberries and eat them. Hubby takes it up another level--he has found wild grapes there, as well; at some point in the distant past, someone planted apple trees on the property. They haven't been tended to, but my husband has picked them and made applesauce from them. My kids think it's fun to join in the picking--we just have to watch out for poison ivy. Wild grapes -- I bet those make the most delicious grape jelly ever! We have something called Oregon Grape, here. The berries are tiny and have large seeds, but I've picked them before and made jelly. I may try that again this year. This is fun reading all of the different types of plants people can forage in different areas! I'm not a foraging as I haven't educated myself on what's safe and what's not safe. I also moved from the country to the city 2 years ago. I just wasn't fond of foraging since I didn't want to meet the end of a shotgun if I ventured out. Farmers where I live didn't like people digging around on their property. We have nothing growing yet that can be harvested and it's snowing here in Michigan today! Dad will be sure to give me all his surplus "safe" veggies when he can finally plant and harvest his garden. He is THE master gardener and he reminds me that I'm just an amateur. I had a huge one when we lived in the country but now I rely on Dad. My salad today came from the grocery store. I had a lovely salad in a jar! Snowing in Muskegon now! Boo. Give us back the weather we had on Saturday. I love Michigan--but I don't always love our weather. How wonderful that your Dad is such a successful gardener! And you get to reap the yummy benefits! And I agree about not wanting to venture onto someone else's property. We forage either on public strips of land (for blackberries, such as at the local elementary school), or in our own small woods on our property. Snow! Well, it will soon be gone, and full-on spring will be there! I've been googling the subject of foraging where we live. I think it is an activity I wouldn't mind doing in retirement. We gathered guava and macadamia nuts at the base of a mountain where we live long long ago when the kids were young. Haven't done anything like that since. Now those are quite the delicacies to be able to forage -- macadamias and guava! I would think that foraging would be a pleasant (and free) activity in retirement. A nice day out, with the bonus of freely obtained foods. When I was little and we lived in the Midwest, my mother would take us to forage for purslane, black locust flowers, and mulberries, and I remember disliking it very much, even when it was right in our backyard! Now I read about these ingredients in high end restaurants everywhere, and professionals foraging for them as well to sell. But as karma has it, I live in a city and don't have easy access to the free stuff anymore. Looks like my mother was a foodie before it was cool. Or, more likely, she was just frugal and very wise. Isn't it funny what we think is "inferior" when we're young turns out to be the very thing that is "foodie" when we're older, like homemade breads (artisan), kale (hipster food), or purslane (gourmet). My daughter was telling me that the definition of hipster is doing something before it's fashionable. She was referring to our growing kale for the last 20 years -- we were hip before we even knew it! Haha yes, very hipster indeed! You found today's "superfood" trend 20 years early! This whole farm to table trend has really prompted us to rethink the value and wholesomeness of what we can glean from our own backyard.